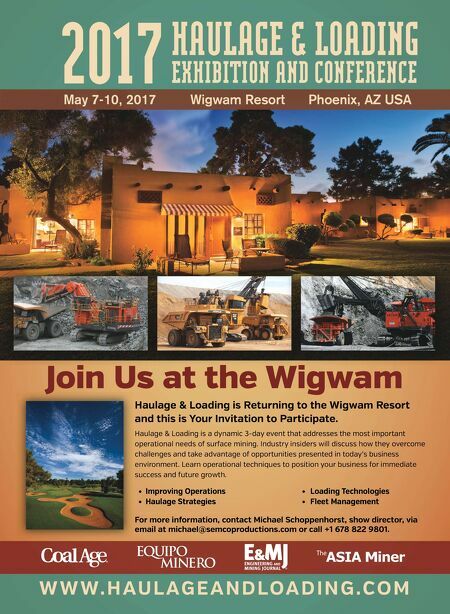 24 www.coalage.com March 2017 power technology continued an annual basis. • In the European Union, where there is a goal to reduce emissions 40% by 2030, these solutions can help drive efficiencies from coal reliant countries like Poland where coal accounts for 80% of electricity generation. • In Africa, South Africa has the biggest opportunity for fuel and carbon savings (23 million mt) coming from upgrades in the coal power sector. To learn more about GE's Global Power Plant Analysis, visit www.gereports.com/ ge-power-plant. First Fully Commercial Plant Launches, Captures CO ² at $30/mt During October 2016, Carbon Clean Solu- tions, a leader in CO 2 separation technol- ogy, launched a new project that will see more than 60,000 mt of CO 2 captured from a 10-MW coal-fired power station based near Chennai, India. Post-startup, the pow- er station is set to become a zero-emission plant. The ground-breaking project, believed to be the first of its kind, is privately fi- nanced and will capture CO 2 at just $30 per/ mt — much lower than the $60/mt-$90/ mt capture costs typically observed in the global power sector. The captured CO 2 will then be used by Indian firm, Tuticorin Alkali Chemicals & Fertilizers (TACFL), for soda ash produc- tion. Aniruddha Sharma, CEO at CCSL, said, "This project is a game-changer. By captur- ing and crucially, reusing, CO 2 at just $30 per/mt, we believe that there is an oppor- tunity to dramatically accelerate uptake of CCU technology, with its many benefits, around the world. This is a project that doesn't rely on government funding or sub- sidies — it just makes great business sense. We are delighted to be partnering with TAC- FL to make this project a reality." This announcement comes following the successful completion of CCSL's pi- lot testing program at Technology Centre Mongstad, the world's largest and most advanced facility for testing and improving CO 2 capture, in May 2016. The pilot yielded results that showed that use of CCSL's solvent dramatically re- duced emission levels and lowered corro- sion, while improving system reliability. In related news, CCSL appointed Will Shimer to run the firm's North American opera- tions from Chicago. GE Upgrades Polish Power Plant Highlighting its growing portfolio of solu- tions to help support the long-term role of Poland's coal-fired power plants in Europe's energy mix, GE's Power Services business will modernize one of three Zamech-made turbine-generator sets at Veolia Energia Poznań ZEC SA, a 275-MW district-heating plant. "We are pleased to select GE to help us increase the efficiency and output of our steam turbines," said Jan Pic, member of the board and operational director of Veolia Energia Poznań ZEC. "This project will help the station operate more efficiently, as we want to strengthen our position in a very competitive environment." The Veolia Energia Poznań station fea- tures one, 65-MW Zamech unit and two, 105-MW Zamech units. GE plans to in- crease Unit 3's output by up to 6 MW (the extra power will be sent to the local grid) and also improve turbine efficiency by up to 6%. Additionally, to improve the turbine's operational flexibility, during periods when there is no demand for electrical power, the operator will be able to disconnect the low-pressure (LP) part of the steam turbine while it is in full district-heating mode. This will allow the operator to use thermal pow- er for the preheating of district-heating wa- ter only. "When GE acquired Alstom Power's technology portfolio in 2015, it absorbed the ability to service generation equip- ment from other manufacturers, includ- ing the Zamech turbines installed at the Veolia Energia Poznań station," said Pascal Schweitzer, general manager of GE's Pow- er Services business in Europe. "Our coal business is well-positioned to respond to future energy needs. We have one of the highest-efficiency, lowest-emissions tech- nologies coupled with our digital solu- tions, and we are excited to help position Veolia to remain competitive and 'win' with its existing fleet." Veolia in Poland, which is one of the leading providers of services in the areas of energy, water and wastewater as well as waste management, is present in 74 towns and cities including Warsaw, Łód and Poz- na. The company is the largest private op- erator of district heating networks across the country. 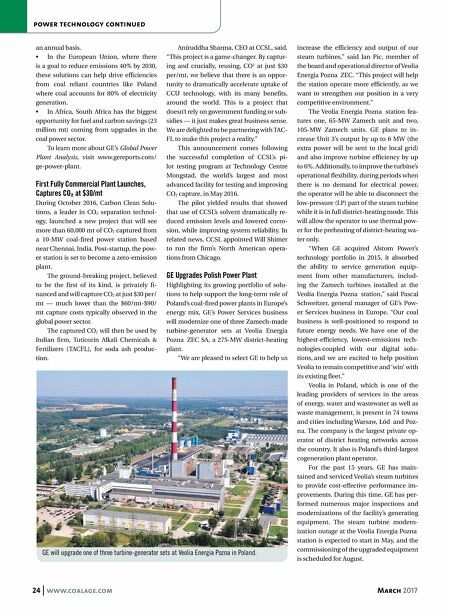 It also is Poland's third-largest cogeneration plant operator. For the past 15 years, GE has main- tained and serviced Veolia's steam turbines to provide cost-effective performance im- provements. During this time, GE has per- formed numerous major inspections and modernizations of the facility's generating equipment. The steam turbine modern- ization outage at the Veolia Energia Poznań station is expected to start in May, and the commissioning of the upgraded equipment is scheduled for August. GE will upgrade one of three turbine-generator sets at Veolia Energia Pozna in Poland.